People used to write on actual paper. Paper made from wood. Wood produced from trees with a pen made from plastic and ink. People like me would write for hours. It was all we had to do. Without the internet, writing things down was our only record of our existence beyond the air we were absorbing and the footprints we were leaving. I sat that night in my room in a one bedroom flat above my mother, writing for what I thought would be my last time. I had volumes of thoughts recorded in little spiral bound books hidden beneath my bed for only me and the demons to read. I was playing a show with my band at the time "Faces of Adam," one of two bands named that in the Detroit area...coincidence? Probably. There were likely to be two narcissistic Adams who could sing in the area and I was one of them. I was on stage. The crowd was fierce. By fierce I really mean, not paying any attention at all to anything I was doing. I will always hate when people do that to me. I sang for a minute, but something was eating me that night. Something wouldn't let me live another two hours. I looked into the crowd and saw him. Cold is what I named him. This demon/human freak of nature that I would see when rising in the night. This mixture of temperature and emotion, humanity and deity. It was evil. It also happened to be my best friend at the time. Someone I really counted on to keep me from being truly alone. Cold wanted the worst for me. I did too. He was the only one paying any attention to my bleeding that night. The only one that offered any assistance. I stopped singing as the music played on. I looked into the crowd and no one seemed to notice. Wasn't news to me, it was only my first show with this band that I would never see again. Can't even remember their last names right now. They bought a song from me soon after and that was the last I heard from them. I walked off stage, not looking up, and through the front doors and out onto the city streets. I walked 2 blocks or so to my home and went up the dirty carpeted stairs and into my flat door. I sat on my bed and looked at this sheet of tree that once inhabited the woods untouched by human hands. I set my pen down and wrote the most beautiful thing I have ever written...right over the last most beautiful thing I had ever written. I was too drunk. I didn't even notice pages of pen as I wrote right over the top of it. I set the notebook down on the bed for Will to find...he would be coming over in just a few minutes. I walked down those tracks for centuries. The air was October in Michigan. For those in Florida, come visit Michigan in October to understand what that means. I counted the dark brown wooden boards that creaked beneath me as I stepped one more step closer to my last. I spoke to myself out loud. I reasoned that what I was about to do was the only way to alleviate the pain. I could not stand to feel alone anymore. I kicked rocks as I went to try to lighten the moment and turn it into a game that ended in a loss. I found my spot miles down the road. In front of me were overgrown weeds in front of the lights of distant houses. I liked it because I loved to look into the warmth of people's homes and pretend I was a part of their family, normal, with two parents, a dog, and not me. I only wanted to watch from afar. I didn't want to begin to think that there was hope of anything different for me. 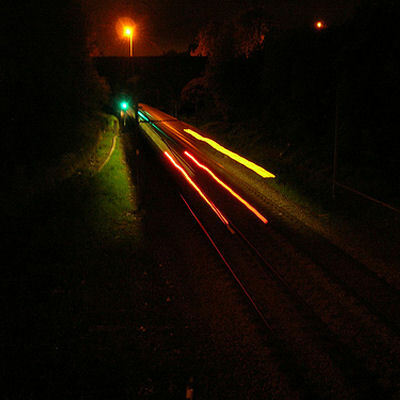 I laid down on the tracks...the cold steel shocking my neck at first. I had spent weeks in the library researching a suitable method of ending my life and this was the most fool-proof. Cutting gets your rescued and put in the mental hospital. Shooting gets you paralyzed and potato-ized. Hanging worked but was too slow for me. I didn't have access to a grenade. I chose a train... Mostly because my uncle Dink had trains in his basement and they amazed me. I thought about that legend that your mind keeps firing 6 seconds after being removed from your body. It deterred me before, but not this night. I was determined to make this night and this train a hero of the world. I was gonna lay there no matter how scared I was. I would not move. I looked down the dark tracks into nothing until I saw the distant headlight. My breathing picked up. It was cold and I was shivering, but never more than now as I could see the blade dropping on my neck. The tracks rumbled beneath me. My body echoed. I could feel it wanted to get me. I could feel my body resisting. My mind had seen enough though, and there was to be no leap from these tracks from me. I wasn't listening to reason, even if it were from my own DNA. It got closer and closer. I saw that kid sitting under his top bunk bed weeping. I could see him throwing that football. I could see him collapsing at the dismissal of his future. I felt liberated from my own horrible future. I looked into the lights of this 240,000 pound razor headed for my head and closed my eyes forever.